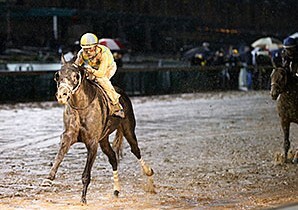 John Oxley’s Airoforce splashed over the sloppy, sealed track at Churchill Downs Nov. 28 with nary an issue, closing gamely to grind out 1 3/4-length victory when making his dirt debut in the $200,000 Kentucky Jockey Club Stakes (gr. II). LEXINGTON, KY (Nov. 5, 2015) – Don’tforgetaboutme, a 3-year-old winning half-sister to recent juvenile stakes winner Mo Tom, sold for $675,000 to Claiborne Farm Bloodstock, agent, to top Thursday’s fourth session of the Keeneland November Breeding Stock Sale, which was marked by increases in average and median prices. 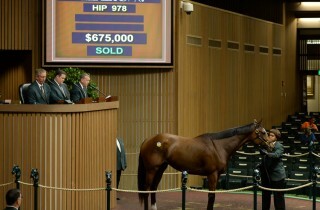 Four Star Sales was the leading consignor, selling 17 horses for $2,797,000. 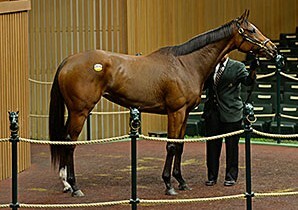 Don’tforgetaboutme, a 3-year-old daughter of Malibu Moon, was purchased by Claiborne Farm for $675,000 early during the Nov. 5 fourth session of the Keeneland November breeding stock sale.